The End of an Era. Literally. As promised quite a while ago, here is a follow-up to my post about Eastend and the Cypress Hills. I travelled to that area in late September, 2008, with museum artists Betsy Thorsteinson and Debbie Thompson, and cameraman Bruce Claydon. 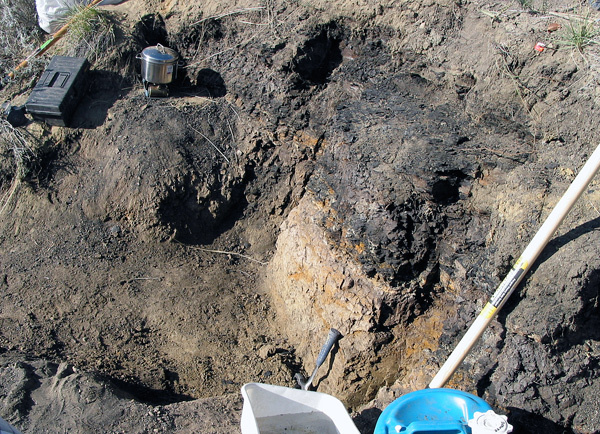 We planned to collect a sample of the Cretaceous-Paleogene boundary for the Manitoba Museum. 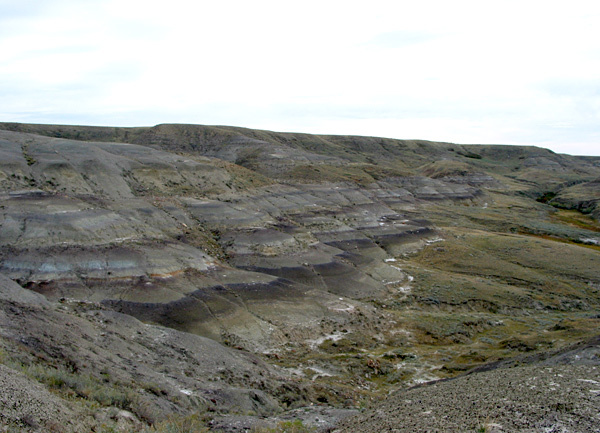 The K-Pg (formerly called the K-T) is the stratigraphic horizon that defines the end of the “age of dinosaurs,” and is characterized by a distinctive clay that was probably produced by the impact of a huge asteroid. We arrived in Eastend at dusk on Friday. 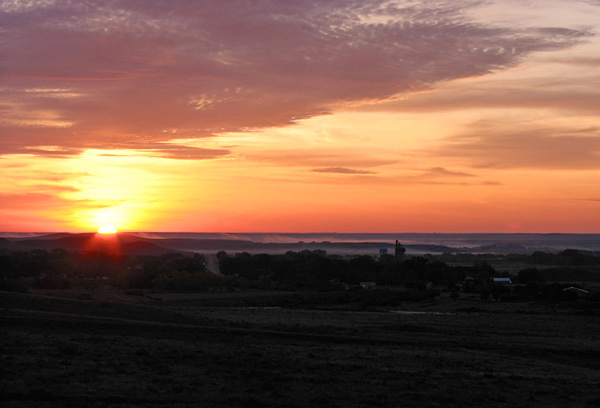 It is a longish run, and to make it in one day we left Winnipeg in the early morning light. Last night the light was dim and we couldn’t really appreciate Eastend’s setting, but we are able to drink it in this morning. 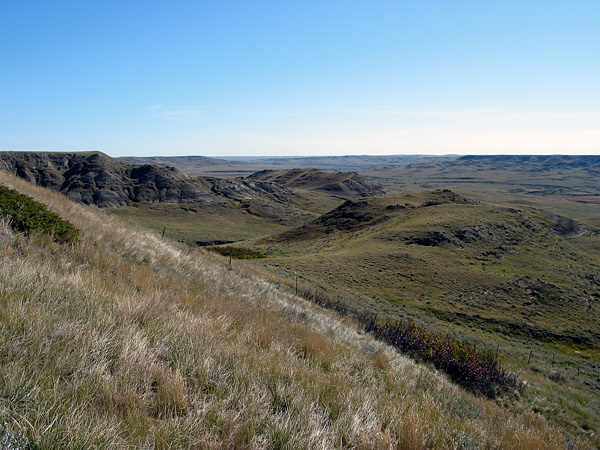 I am immediately reminded that this is an utterly splendid piece of the world; quite the antithesis of the “boring flat prairie” that so many people seem to mention when the subject of Saskatchewan is brought up. 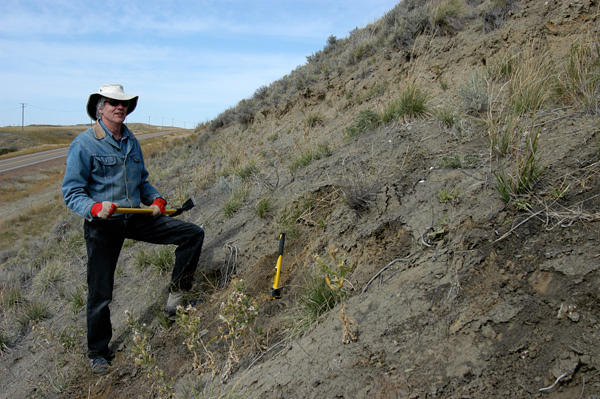 Tim Tokaryk of the Royal Saskatchewan Museum has kindly offered to show us the K-Pg boundary site. After breakfast we meet Tim at the T. rex Centre, then follow him cross-country to the site, which is on the wall of the Frenchman Valley south of Shaunavon. Travelling at speed on the loose gravel, raising our own clouds from the dust-dry section roads, it begins to feel-like an adventure, and more than once the pebbles flying from other vehicles’ tires make me fear for our windshield (which will, fortunately, survive the trip only slightly scathed). There is a very good reason why many trucks in rural Saskatchewan sport chrome running boards and sloganned mudflaps. Contrary to the opinions of trendy urbanites, these are not just unfathomable redneck fashion statements. The site is much as I had remembered it. The advantage of this place is that the exposure is good, and there is little vegetation to get in the way. The disadvantage is that the hill is much bigger and steeper than I had recalled. It will turn out to be rather a challenge to move the 5 gallon water carriers and 50 lb bags of plaster to the boundary level, which is, of course, near the top of the slope. But it will be very easy to bring down a several hundred pound sample of the sediment layers. So perhaps it is for the better that the site is up slope from parking, rather than the other way around. Tim explains where we will find the boundary horizon if we dig down (yes, this will take quite a bit of digging), then we get back into the vehicles so that he can show us the area where they collected the T. rex nicknamed Scotty. We drive to a beautiful place a few kilometres away, up the Frenchman Valley, and Tim generously consents to let Bruce get some film footage of him explaining the T. rex excavation. We head back to the boundary site, thank Tim for his help, and settle down to work. 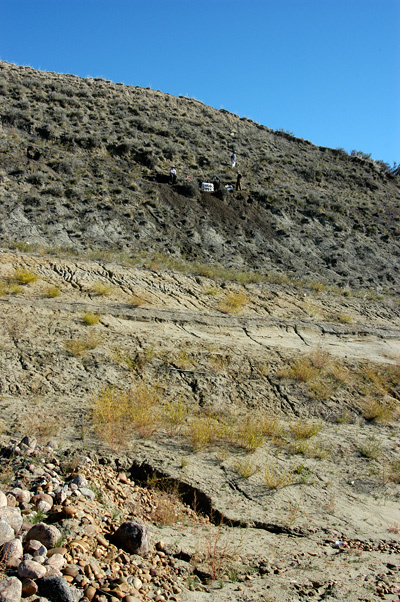 We haul our digging gear up the slope and start making test pits to try to determine where to extract our sample. Betsy and Debbie are both very hard workers, and I really have to apply myself so that I don’t appear to be a slacker. Bruce is always on the move, up to the top of the slope, down below us, hovering around us, always shooting, asking questions. I need to give him coherent answers and explain what we are doing, but in the heat of the work I find that I am tongue-tied and stumble over the words, or say “um” far too often. There’s a reason why, on the old Wild Kingdom TV show, Marlon Perkins did the talking while he sent Jim to capture the wildebeest or zebra. It wasn’t just that Marlon preferred to have Jim do the more dangerous job (although I certainly would, given the choice!). It is genuinely impossible to do hard focused work and clearly explain what you are doing at the same time. We work until the sun begins to go down, clear a possible site, and begin to cut a vertical surface. I am not really satisfied, however, that we have found the part of the succession that we came to collect. I am not dispirited by this, just uncertain and questioning. I will have to sleep on it, and will reconsider in the morning. The next morning, after breakfast, we go back to the T. rex Centre to look at a sediment sample that Tim had collected from the same site a few years ago. 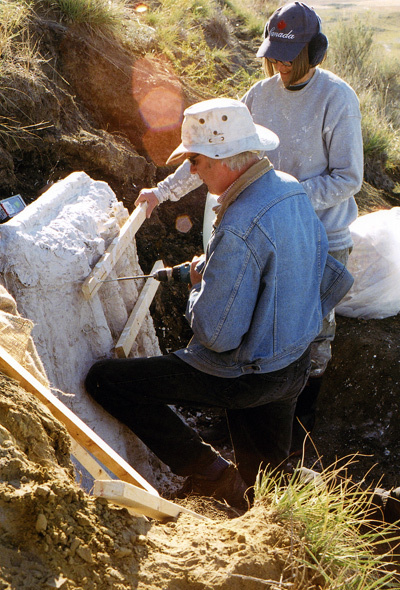 We examine it closely, imprinting a search image of the precise tones, textures, and layering of the various sediments, then drive to the site for another go. 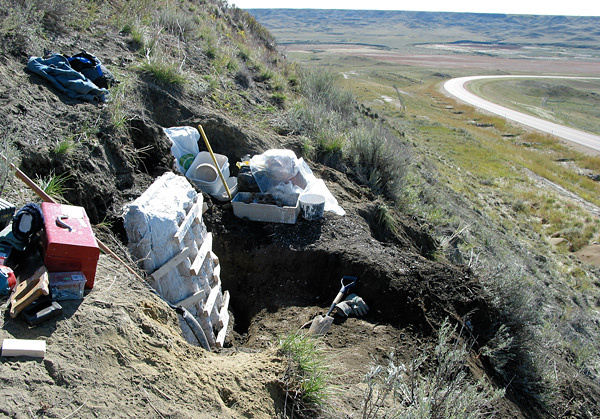 Working laterally along the scarp, we start to clean back the overburden in a couple of new places, digging larger pits to examine the succession of sediments. By lunchtime we have decided to concentrate on one place where the boundary clay can be clearly seen (it is not a continuous layer). We begin to “develop” the surface into a pillar so that it can be extracted, then take a break. After lunch, up on the scarp, I have another look, compare the succession to the publications about this area, then decide that this still needs further confirmation. This is one of those times when I realize that technology has changed fieldwork irrevocably. Pulling out my cellphone, I call Dr. Art Sweet at his home in Calgary (this is Sunday afternoon). Art is an expert on these rocks, and he has given me his number in case I need to “call a friend” for the answer. I carefully describe the succession of sediments to him, and its location on the slope. He assures me that all is good. So it is a go. Time to really settle down to work. The interval between lunchtime Sunday and lunchtime Tuesday includes so much backbreaking effort, so many setbacks and minor disasters, so many supplies to be found, and so many bags of plaster to be hauled up the slope, that the events merge into one seamless, slightly pulsating mass. You can be grateful that, since the sequence is far from clear in my mind, I won’t be describing it in detail or order. We cut back around the sample with mattocks, switching to hammer and chisel where the sediment becomes harder. Every few minutes we have to take a break to rest weary muscles, then shovel the loosened sediment out of the way so that we can continue to cut the pillar. Once it is exposed on three sides we need to make a jacket, or rather, Betsy and Debbie will make the jacket. I will try to keep them supplied with materials; the jacket will be made of burlap and wood (which are light), glued together with plaster and water (which are far from light). I will be very weary by the end of each day here, but I will be feeling tremendously fit by the time we go home. While Betsy and Debbie are jacketing, Bruce and I can go and shoot additional video that will be needed for our gallery exhibits. 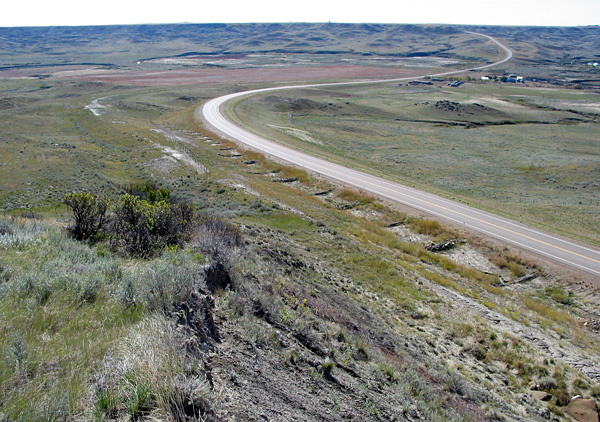 First, we take the van and drive north toward Shaunavon, so that I can narrate an overview of the project while being filmed driving down the highway to the site. It is a very good thing that we don’t meet any other traffic, given my multitasking abilities. Back on foot, we do a slow traverse of the slope leading up to the site. This is much more pleasant. First we look at the beautiful river-channel sandstones of the Cretaceous Frenchman Formation, which are overlain by clayey floodplain deposits as we move up toward the boundary. The boundary clay above is not particularly thick, but it is very distinctive in colour and texture, particularly when it is damp in the bright sunlight. I dig out the boundary clay, examine it closely, rub it between my fingers, and yes, taste it (so I am probably now an iridium anomaly). The clay is beautiful – very smooth, soft, soapy, cleaves conchoidally, and has a colour almost the same as that of the flesh-coloured crayons we used to use in Grade 5. Standing at that level on the scarp, I imagine a landscape covered with this stuff, all the last T. rex and Triceratops smothered by a pastel-coloured nightmare world. We cannot, of course, see the iridium anomaly in the field, nor can we readily observe the fine-scale succession of sediments at the boundary that has been recognized by Art Sweet and others. But we will have to assume that what we are collecting contains all of those colourfully named intervals and features: the ejecta layer, the fireball layer, the fern-spore anomaly. Above the boundary, the character of the sediment changes with the beginning of the Paleogene Epoch. First, dark coaly shales suggest a stagnant, swampy plain rich in tree growth. These are overlain by beds of true coal, and above those the modern plants and soil cover the upper part of the slope. Bruce and I continue upward, taking a break on the very top of the scarp. The Frenchman Valley, as seen from the site. High on the slope, this place feels a lot like an English moorland. Looking across the valley so far below, with the cold and remarkably clear breeze contrasting with the warm sun, hearing a few birds singing, I might be sitting on the Whin Sill west of Newcastle upon Tyne. Except that there are cacti here (so I had to be careful where I sat!) and I don’t think I have ever seen such a dry day on the Whin Sill. The front, sides, and top of the field jacket have been constructed, and the plaster has hardened. Now we have to cut down through the tough coal at the top of our pillar of sediment, while keeping in position the part we want to collect. Fortunately, I had been given some very good advice about this by Art Sweet. For the first time in my life, we have brought a handsaw on a geological field expedition. It is very odd to be sawing through a sediment layer, but the coal is really a pressure-toughened woody amalgam. You can’t extract it cleanly with hammer and chisel. The saw is very slow, but it does the job. We try to finish chiselling through the clay at the bottom, but it is tenuous and resists our efforts. We eventually manage to lever out the package, but I fear that I have displaced the sediment layers with one of the final pushes. The back of the package is plastered on, and it is left to dry thoroughly before we can move it. Though we work late, time passes very quickly since there is so much to be done, and we are so very weary when we make the final descent to the vehicles. The sun is setting, the valley is already dim, and some way off to the west we hear a coyote yipping. It is answered by another nearby. It is time to leave. Back at the cafe in Eastend, we settle into our now-customary booth, appreciating once more the enveloping primitivist historic mural that covers the walls. By this point I don’t really mind what I eat, and pizza sounds good. 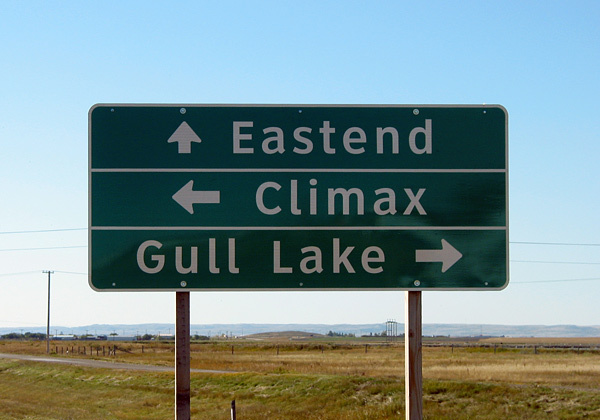 Betsy has a somewhat more difficult time; it is always “interesting” to travel around the rural west with a vegan. Fortunately, she is also not that particular about what she eats, as long as it is within her dietary requirements. But I suspect that she will be very tired of toast by the end of this trip. It is a beautiful evening for the end of September. Betsy and Debbie have wisely headed for sleep, but Bruce and I decide to wander over to the hotel in the centre of town for a beer. The bar, a more modern addition to the old hotel, is graced by a display of the varied cattle brands of the ranches that surround Eastend. The Pilsner is cold. The world is a good place. On Tuesday morning the package is ready to move to the van, and Betsy is working on a small second package that can act as a back-up in case there are issues with the big sample. Lee Gilbert from the Eastend T. rex Centre has volunteered to assist us, as the big package is very heavy. We wrap the package in a tarp and attach ropes and straps. The first part is very easy. We tug on the straps to get the weight shifted from the sediment platform on which it rests, but then it begins to plow down the hill of its own accord, gathering speed and floating boat-like toward the bottom. We have to restrain it, but only with modest force; the steepness and texture of the slope are quite perfect. Of course this condition will not persist all the way to the road. The lower slope is rutted and cobbled down to the ditch, which rises to the road. We lash the package to a hand cart, but it is still tough going, and Bruce has to place his camera on a tripod so that he can assist Lee, Debbie, and me. With considerable toil, sweat, and swearing, the package is dragged to the road surface behind the van. Lee has brought straw bales from the farm, and we manage to raise the package in stages and slide it into the back of the van. In hindsight the process has been remarkably smooth. Still, I don’t plan to move anything that is about the same weight as a dead grizzly bear again in the near future. A live grizzly, perhaps, as it would be easier to move, if harder to direct. Your evocative narrative and photos makes me feel like I was there, and glad that I wasn’t. 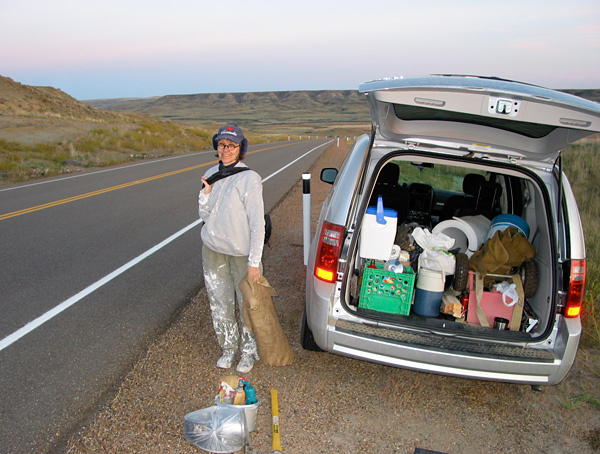 Aren’t you glad you aren’t a dinosaur palaeontologist, and have to do this every field season? Thanks Sean. I would love to do dinosaur work, but yeah, the older I get, the more I think about working on fossils that are small and light! Thanks for posting this, Graham! It’s interesting to see what field work is really like. You tell it Graham. Saskatchewan is gorgeous beautiful- dips and curves like its name. A lovely peice. Great pics too.